The hidden message in the Dalai Lama's speech! I just revisited an old post from DorjeShugden.com. "The Dalai Lama is very skillful and he foresaw what the Chinese would do for Dorje Shugden. Some would argue it was shrewdness and some would say it was clairvoyance of Chenrezig. It doesn’t matter. Through his ban alone created so much hype and promotion that no pujas or marketing team could have brought Dorje Shugden to the world in such a quick manner. That means the Dalai Lama have never forsaken his lineage and Lamas. In fact, he risked everything for it." It has always been dorjeshugden.com’s firm stand that His Holiness the Dalai Lama is purposely creating the ban on Dorje Shugden with a bigger picture at the back of His mind, which is actually to promote Dorje Shugden, especially in the Chinese world, where a renaissance of Buddhism is expected to happen. Below’s account is a proof that the Chinese are actually promoting Dorje Shugden (despite with less-than-holy reasons) in China, just as what His Holiness has intended secretly. We could have seen this coming. It is just a matter of time that the Chinese would come clean with this. They are doing it covertly now and perhaps later, they will be more open and forceful about this especially when the Dalai Lama is not with us anymore. The Chinese would do anything to break the independent spirt of the Tibetan people, which appears to be embodied by their belief in the Dalai Lama. In that way, the Dalai Lama is very skillful and he foresaw what the Chinese would do for Dorje Shugden. Some would argue it was shrewdness and some would say it was clairvoyance of Chenrezig. It doesn’t matter. Through his ban alone created so much hype and promotion that no pujas or marketing team could have brought Dorje Shugden to the world in such a quick manner. That means the Dalai Lama have never forsaken his lineage and Lamas. In fact, he risked everything for it. He knew many Shugden practitioners would have to ‘suffer’ for Dorje Shugden to grow big. Some would argue that he is not very compassionate. Real practitioners will say that he is very skillful and that he was working for a bigger picture to be realized. Whatever the viewpoint, the Dalai Lama would be remembered by the results of his actions. Thanks Prajna for sharing this information. Indeed I have heard some old monks talking about His Holiness Kyabje Trijang Rinpoche's prediction and advice in the 1970s, that in the future (which is now), it may seem that His Holiness the Dalai Lama and the Protector are fighting against each other, but do not lose hope in both. This goes along the line of what you mentioned above. I do believe that His Holiness the 14th Dalai Lama is Chenrezig too. Not sure if Pemachen you remember, on 25th April 2018, His Holiness the Dalai Lama made a remark about the Chinese Panchen Lama. His Holiness spoke upon his arrival at Gaggal Airport in Dharamsala that it is not unusual for enlightened beings to have as many reincarnations all appearing at the same time, citing the example of a famous Tibetan Buddhist master Khyentse Wangpo. This again shows His Holiness is very skilful, and what His Holiness meant was that both the Chinese-enthroned 11th Panchen Lama (Gyaincain Norbu) and his 1995 candidate, Gedhun Choekyi Nyima are equally rightful heirs to the throne of the Panchen Lama and, in fact, the Dalai Lama acknowledges the Chinese Panchen Lama to be the official 11th Panchen Lama. What the Dalai Lama said is tantamount to an endorsing the Chinese-enthroned 11th Panchen Lama Bainqen Erdini Qoigyijabu (Panchen Gyaincain Norbu) and a recognition of his legitimacy as an emanation of the highest-ranking Tibetan Buddhist lama in Tibet, in the Dalai Lama’s absence. I don't know how all this will play out in the future, but definitely, His Holiness is a master of speech. Sorry PrajNa, I was away for holiday. Yes, I remember His Holiness the Dalai Lama made a remark about the Chinese Panchen Lama. In fact, nobody asked His Holiness about the Chinese Panchen Lama. It is odd that His Holiness just brought it up, and in his own way, confirmed that Gyaincain Norbu can possibly be one of the many reincarnations as many reincarnations can all appear at the same time, just like Khyentse Wangpo. I wonder if this is a political move as advised by the Chinese due to the negotiation of Samdhong Rinpoche's private/secret trip to China at the end of 2017? I do hope to see the reconciliation between His Holiness the Dalai Lama and the 11th Panchen Lama, that would be great news for us Tibetan Buddhists. Thanks for the video links. His Holiness the Dalai Lama is really skilled in his speech and a seasoned politician. You can see in the recent interview below, which I have quoted some of the texts. In a freewheeling interview with HT, the Dalai Lama speaks on wide-ranging spiritual and political issues, including what he thinks of India-China ties. Quite Good… Not very good ….. for an 84-year-old person, quite good. I go for morning walks in Dharamshala also….Here I take around 600 steps each morning in the monastery. What was the reason for indefinite postponement of the 13th Religious Conference of the Schools of Tibetan Buddhism and Bon Tradition (November 29-December 1, 2018) in Dharamshala? The conference was called to discuss the future of the institution of Dalai Lama. One important lama (Kathok Getse Rinpoche, Head of Nyingma school) all of a sudden passed away. The conference had to be postponed as it was a period of mourning . It has nothing to do with 17th Karmapa Ogyen Trinley Dorje not getting a visa to visit India. I could not meet Thaye Dorje as he was not present when I went for pilgrimage to the Stupa. Do you talk to both Ogyen and Thaye ? No I have not yet met Thaye Dorje. Recently, the two met in France. A rightful beginning. Shamar Rinpoche, nephew of 16th Karmapa Rangjung Rigpe Dorje who took refuge in Sikkim after 1959 uprising, told me that there were indications that Thaye Dorje was reincarnation of the previous Karmapa. In the meantime, Situ Rinpoche (the rival regent) appointed Ogyen Dorje as the Karmapa. I mentioned to Shamar that a high lama in 19th century had five reincarnations. It is possible for 16th Karmapa to have few reincarnations but the holder of the seat should be one. This is like the two Panchen Lamas with Gedhun Choekyi Nyima (proclaimed by Dalai Lama as reincarnation on May 14, 1995) still alive (other being Gyaltsen Norbu who was appointed by the Chinese government). But then some group told me that I should not be talking about the possibility of two or three reincarnations. I said, OK, then I will keep quiet. Then who will decide the rightful one heir to the seat? Situ Rinpoche found a remarkable child (Ogyen Dorje) in Tibet. They came to see me and finalise that. Then I said yes to Ogyen as the reincarnation of the 16th Karmapa. There are now two Panchen Lamas, two Karmapas, now the question comes to the tallest lama, the Dalai Lama. Have you initiated the process of your reincarnation because the Chinese government has already initiated the process? No, no, no. That is not my business. I made it clear as early as in 1969 that it was up to the Tibetan people to decide whether the very institution of Dalai Lama should continue or not. They will decide. I have no concern. Since the 5th Dalai Lama, the (person holding the) title was the head of both temporal and spiritual affairs. Since 2001, I have proudly, voluntarily and happily given up the political role. We have already achieved elected political leadership (Centralized Tibetan Administration in Dharmshala) and they carry their full responsibility about our temporal affairs. I have totally retired since 2011. So my thinking is more liberal than Chinese thinking which is more orthodox. But how will people under stress in Tibet decide whether the institution of Dalai Lama should continue? It should be decided in a free country, not in Tibet, where there is no freedom. Have you initiated the process of dialogue on the Dalai Lama institution? No. Formally, not yet. As the Dalai Lama institution is close to Mongolia, Mongolian people should be involved. I think there should be an international Buddhist conference involving Himalayan people and other Buddhist countries to decide on this. My main concern is that my body, speech, mind and life should be useful to other people. So long as space remains and suffering remains, I remain. My daily prayer is the source of my inner strength. This institution of Dalai Lama, I half-jokingly, half-seriously say, has lasted six to seven hundred years should cease with the 14th with grace. If the 15th Dalai Lama turns out to be naughty as the sixth then the institution will cease in disgrace. The institution could voluntarily and democratically cease with the 14th Dalai Lama being quite famous (he laughs). Has your middle way approach with China worked ? Is it going to benefit Tibetans at all? Oh yes. Like Germany and France after centuries of fighting came together after second World War to form European Union on shared common values, we also want to be part of Peoples Republic of China provided the Tibetan culture, language, knowledge and environment are protected. We get more economic benefit for material development as China is rich economically but spiritually we can help million of Chinese Buddhists. This is mutually beneficial. Historically, Tibet has never been part of China and this even some Chinese historians admit. But past is past, we have to live harmoniously and happily together rather than talk in terms of our nation and their nation. People ask me about the future of India and China relations. I say that neither India nor China has the capability to destroy each other. They have to live happily side by side with minor irritants. Ultimately, Hindi-Chini bhai bhai should be the principle. One must remember that there are around 400 million Chinese Buddhists who are inspired by Tibetan Buddhism, which in turn derives majority of its strength from the Nalanda traditions. So now His Holiness the Dalai Lama is blaming others for keeping quiet on saying there is a possibility that a lama can have several emanations. He is very skilled to say that because now he can acknowledge the Chinese's Panchen Lama as an authentic incarnation while not getting the blame for not accepting China's Panchen Lama in the first place. Who on earth can tell His Holiness the Dalai Lama to keep quiet? No one in CTA has the audacity and authority to do so. It is clear that it is His Holiness who chose to not acknowledge China's Panchen Lama in the first place and now he will say that so that he can be innocent while accomplishing what he needs to do. He is indeed a seasoned politician. Now that he needs to be on China's good side, he will start to act innocent and change his statements on several issues. He has started with Panchen Lama issue and hopefully he will do so for Dorje Shugden ban as well. He can say that it was CTA's idea to ban the deity and push the blame to CTA while lifting the ban on Dorje Shugden. Since China is promoting Dorje Shugden practice now, it will be a good way to get on their good books by doing that. Indeed no one can tell His Holiness the Dalai Lama what to say or not say, he's still the ultimate authority and we all know Lobsang Sangay is just a puppet ruler. If you look at the contrasting message, expression or tone His Holiness had said about the Dorje Shugden ban, it's very clear all of these were His Holiness' manipulation. For better or worse, I don't know. But it is very clear it contradicts each other, and I don't think His Holiness is schizophrenic. There doesn't seem to be any repercussions if you choose not to follow the advise but for the Tibetans it is very clear. But now, why is the Central Tibetan Administration "treating fish and turnips as one" ? 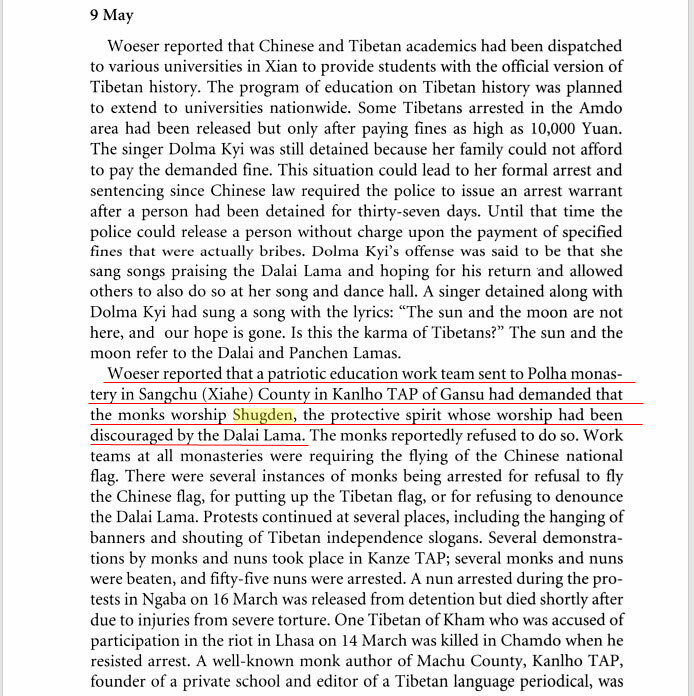 Suddenly the Chinese Panchen Lama is one of the emanations, after years of protests against the imprisonment/kidnapping organised by Tibetans around the world annually on April 25? After 20 over years of saying the Chinese Panchen is fake, now suddenly Gyancain Norbu is the "official Panchen Lama" vs "the one that I [Dalai Lama] recognised". Not only that, now Karmapa Thaye Dorje is also an "emanation" . I wonder if China will use the same tactic, appointing their own 15th Dalai Lama and said that he's an emanation too ? Well, same logic? His Holiness is very skilled in his speech to create another angle to explain things. So, by the same logic as you mentioned, if there are now many emanations, of course, China can use the same logic too, but the Tibetans in India or in exile will not agree with China. The Dalai Lama is now tell the world that there can be multiple emanations of the same Tulku. Can anyone say TWO 15th Dalai Lama's. Not the 14th Dalai Lama. One 15th Dalai Lama from India (anti Dorje Shugden) and one from China (Pro Dorje Shugden). We know China will definitely install their own Dalai Lama. But since it was His Holiness the Dalai Lama himself who proposed this idea of various emanations or reincarnations, it just makes it easier for China to recognise their own Dalai Lama. They already did with their Panchen Lama. I have heard about the bigger picture theory too. It is said that the Dalai Lama is actually helping to promote Dorje Shugden instead of trying to suppress Dorje Shugden practice. It is true that without the ban, no one will really know about Dorje Shugden. In fact, the most famous Dharma protector now is Dorje Shugden. Unfortunately, in this degenerated time, only negative news will draw people's attention. If you read the newspaper most of the news is negative news, how many positive and motivating news is there? For the celebrity to get famous, having negative news will be the fastest way. This is just how the world works now. If this theory is valid, the Dalai Lama is indeed an emanation of Chenrezig, the Buddha of Compassion. Fame and reputation are not important to him. He doesn't mind to be misunderstood by people, his goal is to bring benefit to people. The enlightened beings have their ways of working things out that we cannot comprehend. It could be possible that the Dalai Lama wants to go back to Tibet that is why he is agreeing with the Chinese government. It was actually quite shocking for me to hear the Dalai Lama said the Chinese Panchen Lama could also be the real reincarnation of the previous Panchen Lama. Perhaps it was also a plan of the Dalai Lama to let the Chinese government recognised their own Panchen Lama. This is because anyone related to the Dalai Lama will lose the trust from the Chinese government and it will be very difficult for them to do what they have to do. The Panchen Lama took rebirth in China because he has the responsibility to continue to preserve and spread the Dharma in China. Therefore, it is actually better to let the Chinese government choose their own Panchen Lama. I think there are 2 possibilities that the Dalai Lama changed his tone on the Panchen Lama. Maybe it is because he wants to go back to Tibet desperately that is why he agrees with the Chinese government that their Panchen Lama is real. The other possibility is that the Chinese Panchen Lama is the real one and now it is time to let him take over the responsibility from the Dalai Lama to continue to spread and preserve the Dharma in China. Good theory. Contrary to what the western media says, many Tibetans and Tibetan lamas believe that the Chinese Panchen Lama is real. What does everyone think? The Chinese Panchen Lama is very well respected in China by the Tibetans and the high lamas. These high lamas are attained masters, they will not acknowledge a fake lama and mislead people. If they are paying so much respect to the Chinese Panchen Lama, he must be real. What the Dalai Lama has said about the Panchen Lama could be possible as well. A highly attained lama is able to control their birth and death, he is also able to emanate into multiple forms simultaneously. Perhaps both Panchen Lamas are real and the previous Panchen Lama emanated into multiple individuals in order to preserve the lineage knowing how the situation would be. The Chinese Panchen Lama has a very learned tutor. The Chinese government has given him the best Buddhist education and provided what he needs in order for him to perform his spiritual duty. A few years ago, the Panchen Lama gave a Kalachakra initiation to at least 100,000 people in Tibet. If he is fake, he would not be able to give initiation to so many lay people, Sangha and high lamas. What you said is very sound, Tracy. The thing is, how sure are we that all the reincarnation enthroned are real? We were just basing it on what the lamas said anyway. Whether or not the Chinese Panchen Lama is the real Panchen Lama, for sure he is learned, and for sure he is not normal because he was born amidst auspicious signs. The Taiwanese are generally not pro-China so they wouldn't have made up the stories about the Chinese Panchen Lama. He is definitely a great Lama, whether or not he's the Panchen Lama. I think lamas like Kyabje Gangchen Rinpoche and other high lamas who have met and supported the Chinese Panchen Lama, these lamas won't side with a fake lama.